Hey Tech, Trav, and everyone else at SM. My Name is Garrett Zimmer and I’m 21 years old. 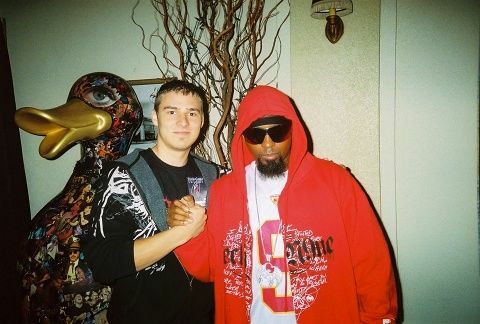 Ive been a Tech N9ne/Strange Music fan since Late 2004. On December 22nd 2004, my father, also named Aaron ironically, passed away from Brain Cancer. In the months leading up to his death i was in severe depression, anxiety, anger, everything. A friend had left a CD at my house on accident, and i listened to it and that was the first time i had ever heard a Tech N9ne song. The song was “Einstein”. When i listened to it, i felt as though i was in a different world, i could feel the energy coming out of my speakers as, an artist that i would soon find out to be Tech N9ne, delivered line after line of intense vocals and killer flow. When the song was finished i replayed it, over and over. I went to a local store and bought both AP and Anghellic. Every song just relieved me from all the stress that i had in my life at the time trying to cope with my Fathers sickness. Techs music brought me into a better place, or at least a different place, when i needed it most. I am now a die hard tech n9ne and strange music fan. I am on TRTN daily and i buy every new release you guys put out. Strange Music and Tech N9ne, brought me through and out of the hardest time in my life. I listen to techs music everyday because when i hear the stories he tells, the pictures he paints with his lyrics, i know that im not alone in the darkness, that someone else understand my pain, even if it is the KOD. I love you Tech N9ne and Strange Music. You guys change lives. Cha! As One Mind, Body, And Soul. We Ward Off Pain And Stress. In LIFE And In DEATH!! !